Avida CBD may be a relatively new entrant into the CBD industry, but it’s a brand which has a lot to offer. Recently established in 2018, this brand markets itself as being focused on helping people to have a more active and healthier lifestyle in a way that’s ethical and all-organic. Their eco-friendly product range comprises of CBD oil (isolate, full and broad spectrum), and CBD vape juices, all made from high-quality industrial hemp and produced to the highest standards in a GMP-certified pharmaceutical grade facility. They are marketed as containing no pesticides, genetically modified organisms or synthetic fertilizers for an all-natural, healthy product. So the big question is, are Avida CBD products worth trying? We checked out their vape juices to find out more about whether they really are a good choice. Avida CBD third-party lab tests all their products and the results of those tests can be found on their site, including batch test results. Everything is very transparent and above board. This gives purchasers complete peace of mind that they’re getting a product which is safe and as potent as it is advertised to be. The Avida CBD manufacturing process is of the highest standards. Their vape juices use CBD isolate which is produced via CO2 extraction processes. There is no THC in their vape juices, so no psychoactive effects will be experienced. 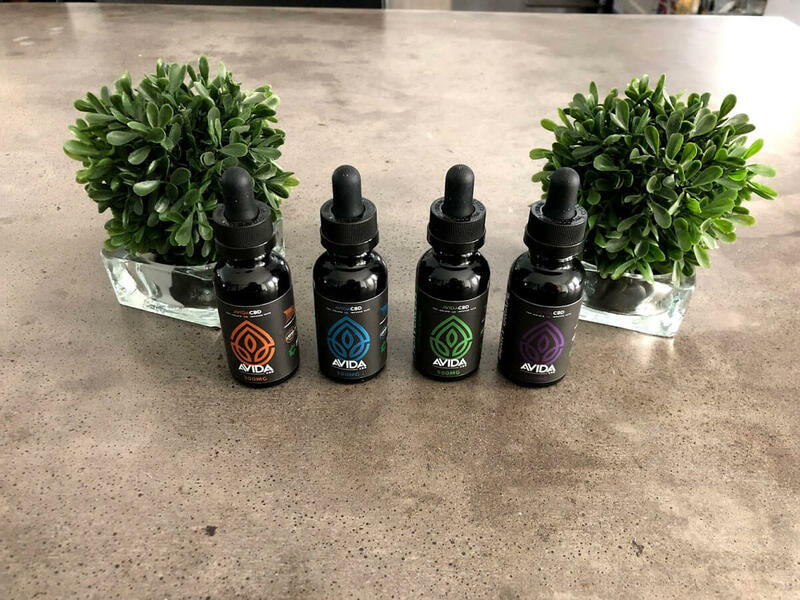 Although the product line offered by Avida CBD isn’t the most extensive, it still offers enough choice of flavors and strengths to satisfy most people. There are four different flavors vape juices to select from, and there are also three different strengths of CBD – 250mg, 500mg, and 1000mg, so every user can choose the right one to suit their individual needs. Although appearances aren’t everything, it’s important to note that Avida CBD’s product line is visually appealing. Each flavor comes in an attractive black dropper bottle with the brand logo in different colors so each flavor can easily be told apart. Interestingly, the flavors used by this brand have been created by a mixologist considered to be an expert in the field and who has been awarded accolades for his recipe for “fried cream cakes” e-juice. If you’re a fan of candy-inspired vape juices, you’re going to love Blue Razz. It has a strong and sweet fragrance which smells like candy, and the flavor is equally delicious with plenty of sweetness. Tasting of blue raspberry candy, this e-juice has a well-balanced flavor which is tongue-tingling enough to satisfy anyone’s sweet tooth. This vape juice also has a candy-inspired flavor with plenty of fruitiness that appeals to any vaper with a sweet tooth. The grape flavor is especially strong, although the overtones of berry add more complexity to the taste. If you love exotic fruits, the Manga Mango vape juice from Avida CBD will hit the spot. Extremely sweet and with a powerful mango flavor, this well-crafted vape juice has enough of a candied edge together with sufficient fruitiness to satisfy anyone. Although Avida CBD’s last vape juice is marketed as flavorless, this isn’t strictly the case. In fact, it has quite a sweet taste which, although not quite a flavor in its own right, does have a pleasant edge that balances out the CBD’s slight bitterness. It’s the ideal choice for anyone who doesn’t want a flavored vape juice but who wants a pleasant tasting experience. If you’re looking for a CBD brand that produces its products in a reputable and trustworthy way, Avida CBD could be the one for you. Its vape juices are well-crafted, taste great and contain no unwanted pesticides or contaminants. Also, since they contain absolutely no THC, there’s no risk of any unwanted psychoactive effects. There are lab test results online to back up the brand’s claims and there is also a choice of flavors and strengths to suit the needs of a wide range of users. If you aren’t a fan of very sweet, candy-inspired flavors, you might want to look elsewhere. However, if you enjoy fruity and very sweet tastes, this could definitely be a great choice of CBD product for you. Visit avidacbd.com for the latest deals and sales.